You might think that “boring mountains” is an odd title for a blog that promotes the study of mountains. But today marks the anniversary of the death of an engineer who supervised the first major boring of a mountain anywhere on Earth when he drilled an 8-mile-long (13-km) 2-track railway tunnel through the Alps. In 1871, the tunnel that Gemain Sommeiller created was completed – after 13 years of digging. When the tunnel linking Italy and France was started, only 8 inches (20 cm) of mountain was gnawed away each day. But Sommeiller soon replaced the men with picks with the tunnel-making machine you see in the photo above. (Even in 1871 some sort of hard hat was part of adigger’s attire.) Sommeiller built a water reservoir high in the mountains to generate the pressure needed to charge a pneumatic system he designed. Boring was suddenly 20 times faster. 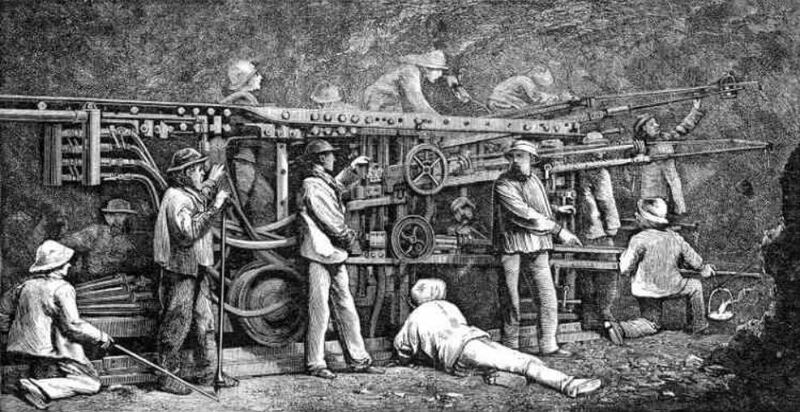 During the decade of machine-drilling, dynamite had been invented and the project put the stuff to good use, even using some of the first electic charging to ignite the sticks. The Mount Cenus Fréjus Rail Tunnel was an engineering marvel when it opened in the fall of 1871. (I guess it still is, actually.) It was twice the length of any previous tunnel. When diggers met (the Italian team punctured a hole through to the French side in December, 1870), their floor was just 2 feet higher than the other side – but horizontally, it was a perfect match. Quite brilliant surveying. There was likely a ribbon-cutting ceremony when the first train used the tunnel. Unfortunately, Germain Sommellier was not the one with the scissors. He died July 11, 1871, aged 56. He lived long enough to see the tunnel completed, but the last rail spike wasn’t driven until a couple of months after his death. This entry was posted in Biography, Engineering, History and tagged mountains. Bookmark the permalink.